Paperback, with flaps, 144 pages, 19.0 x 23.0 cm, 7.5 x 9.1 in. The success concept SOS Trimming without Exercise instantly attained a large readership – thousands of people have since successfully lost weight with this metabolic program from the tropics and have developed a new nutritional consciousness. The secret: a highly effective 7-day detoxification plan and a reorientation in eating habits towards valuable superfoods, such as coconut oil, chia seeds, and gula malacca. 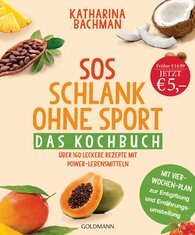 In this cookbook, Katharina Bachman offers many delicious recipes and a practical nutrition program.